A few days ago I had a question. It had to do with tech and I decided to ask some twitter friends for ideas. I wanted to know if I could collect the links I tweeted on Evernote. See the tweets below. 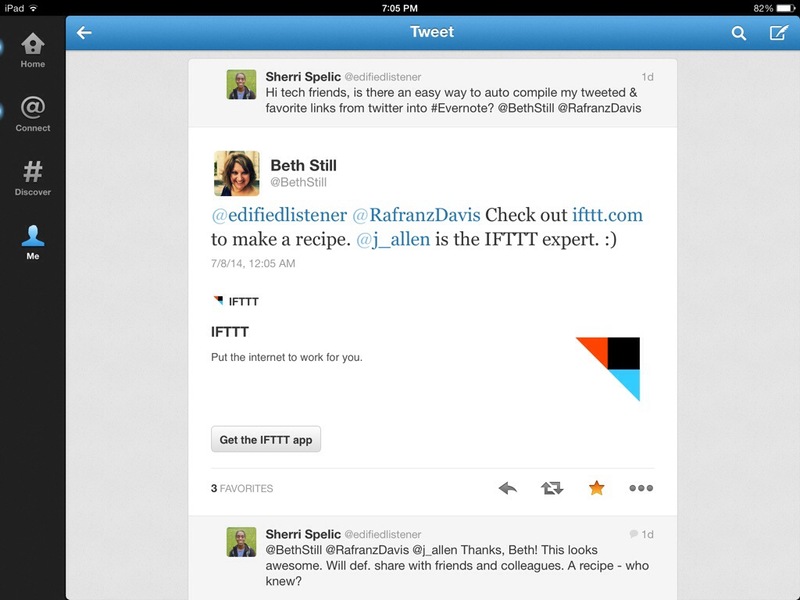 I promptly received an answer: go check out IFTTT.com and make a recipe. So that’s what I did and when I arrived it felt like I had just entered a sort of tech facilitating candy store. IFTTT stands for “If This, Then That” and what it offers is a platform for for creating recipes for apps to trigger and carry out actions on one another. 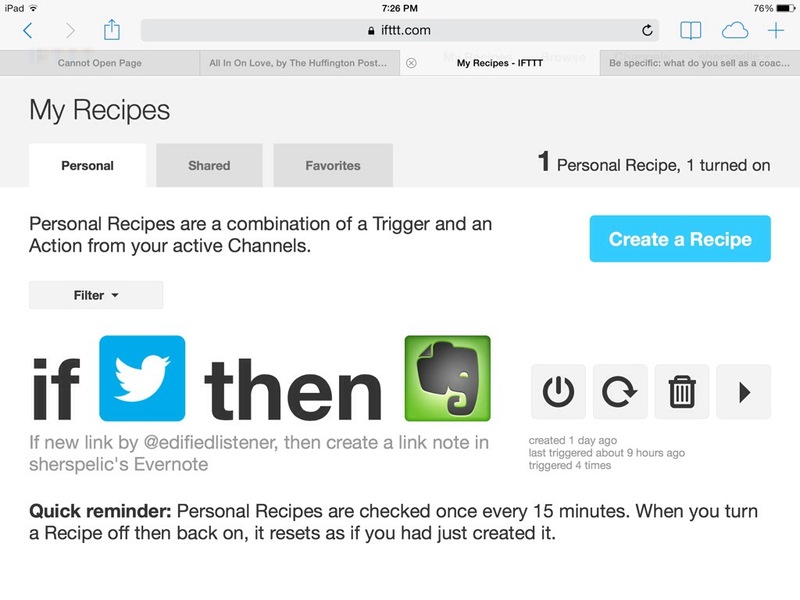 I want my twitter account to talk to my Evernote files and IFTTT makes it possible. What’s cool is that you can create all sorts of recipes to meet your individual needs. On the website itself I fully enjoyed the absolutely user-friendly interface, no-fail, step-by-step instructions, and a generally a remarkably upbeat, encouraging user experience. I understood almost immediately how to define what I wanted and how to make it happen. And once it was all set up, within an hour I had a two new notes on Evernote documenting the links I had tweeted out. Imagine that: I got what I asked for easily, with smiles and a whole lot of satisfaction. That’s product. Asking questions, tapping into resources, making new discoveries, and sharing the experience: that’s process, which in this case involved real people, offering real support in real time with the aid of some useful digital tools. Sounds a bit like a recipe – for learning. Power and powerful. Huge thanks go to Beth Still for responding and sharing. Kudos to IFTTT.com for designing an excellent platform for users to become inventive in meeting their mobile tech needs. Previous: Previous post: Got control? Next: Next post: What are your possibilities?